What type of glue had you used for attaching the paper? I suppouse must be compatible with the depron you had used in the model. At the moment I`d been unable to source some dope in my side of europe (restrictios on shipping). I ordered some from Retromodeller but cancelled the order due shipping restrictions. I´ve used the RDS system in my competition/Composite gliders. Not in scale subjecs. Recently I don´t have more RDS sets, so I am not able to use it again. I`ll have to think about amini Lathe. Ummm. I bought a few RDS sets for Futaba servos. Now I have no more in stock. Ab initio I used the F6, as drawn on the plan, and sheeted the sides. with the bulged sides. 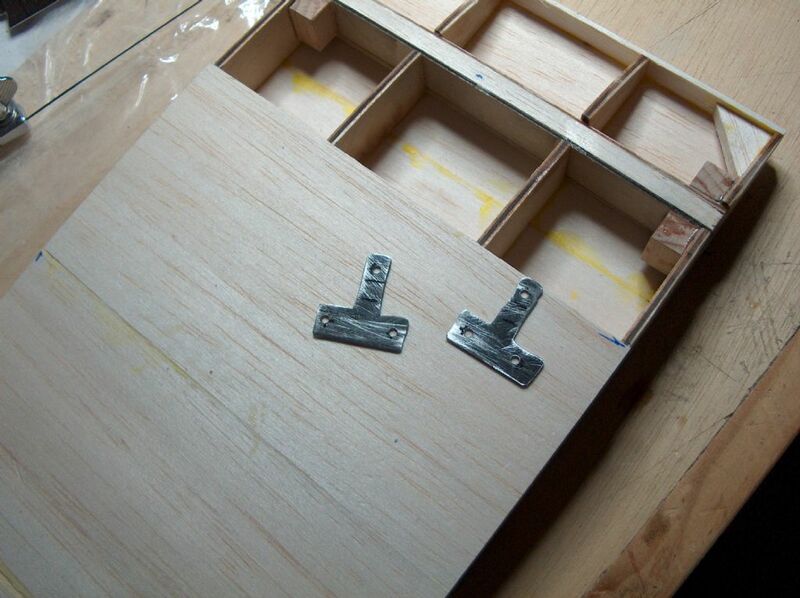 After discussing the wrong shape of the fuse I`d cut the sheeting at the line of the side door. Installed the new F6 as drawn by Danny, and fixed the new sheeting. Now I'm recovering from surgery on my left eye. Also they put inside some product yo cure the injuries that initiated the Lost of eyesight. So probably Next weekend I'll be back with my Fury's. Hi Ernie I"m interested in the masking templates for K3736. I`m sorry for my delay on answering your question. Well, the modell is not ready for covering yet. The sad info it`s that I Will be unable to finish it. I have to quit any type on modelling, Reading, writting, …. On December 18th I suffered the lost of almost all the eyesight in my left eye (the good one). I now see really bad. The image is crushed, tilted and a missing área. Really dissaponting. I Will try to follow the others progrees . As anote have finished the moild for the cowl and after waxing it last monday I layup a first cowl. I`ll open the mould toorrow. Checking the Wesburg Drawings tell that the dihedral of the top wing is 1 degree. 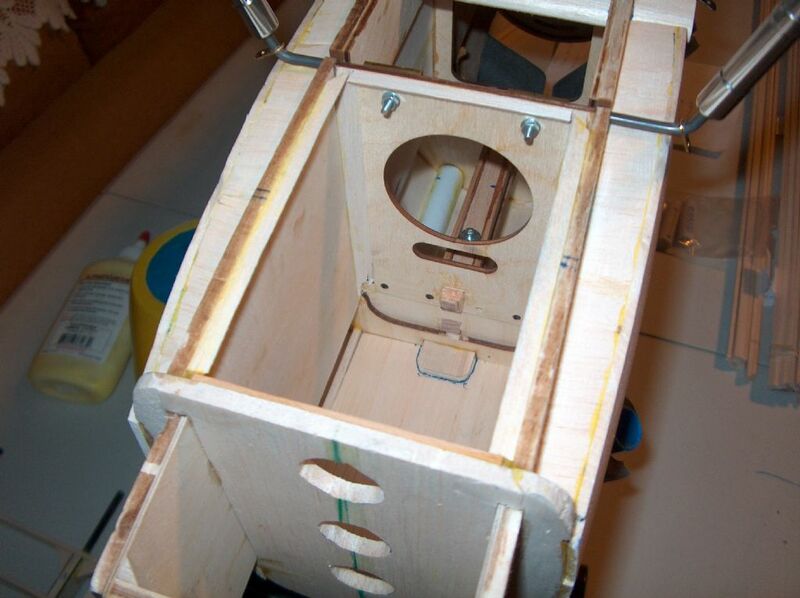 Added the bottom sheet of the nose Hatch. Once glassedI`ll cut the Hatch. Also made a few detail work on the wing pockets for the archor plates of the center panel. Added the missing sheet on the bottom of the center panel. Tomorrow Will sand the foam blocks to shape. 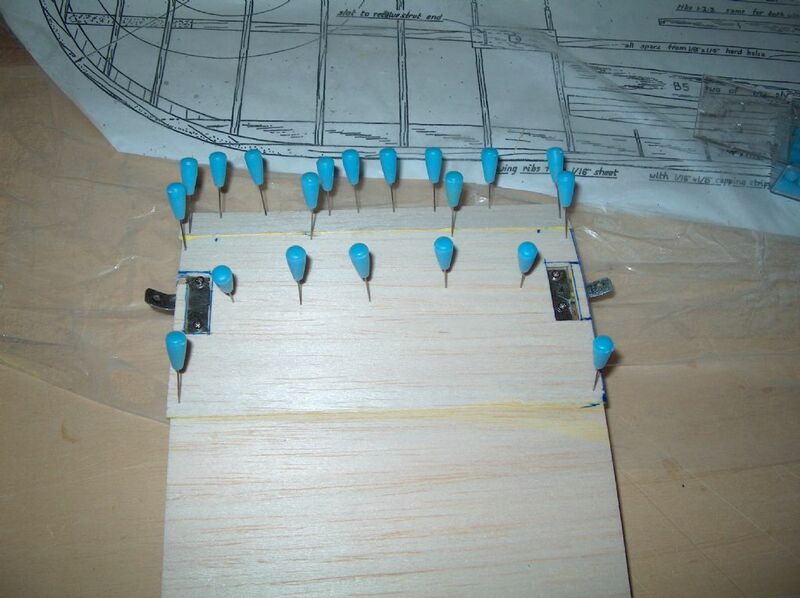 I`ll Split the mould on a top/bottom plan, so I`d made a parting board of melamine chipboard. Also drilled 3 holes for the keys of both parts. I use Steel balls. The parting board and balls are being waxed. Progress of the last days. 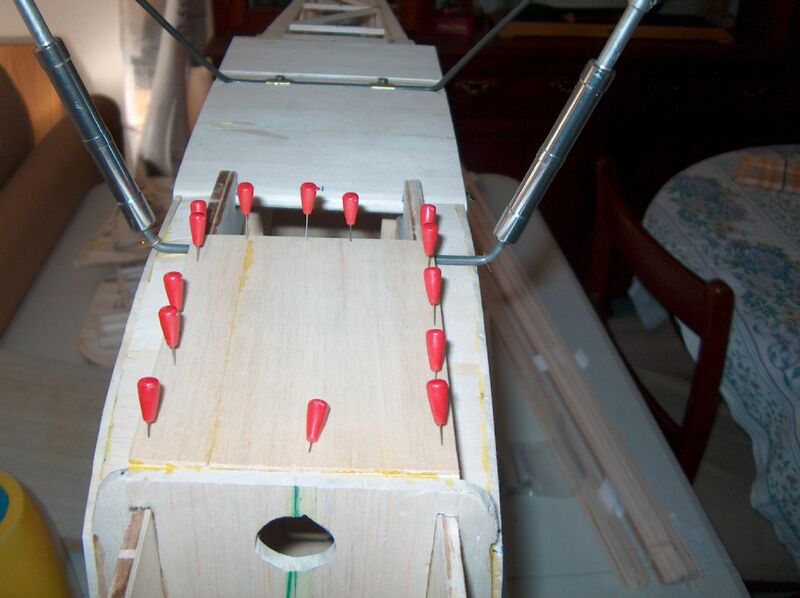 After gluing the ply supports for the struts added the remaining capstrips. Also added the leading Edge strips. Today shaped the leading Edge strips. First used arazor plane, next a sanding block. Also sanded the top trailing Edge strip and faired the wingtip. Stilla bit of sanding to do. Next work is to finish the bottom of the nose. Checking the plan I noted that the block of balsa has no use because the bottom must be more or less 1/8" thick. 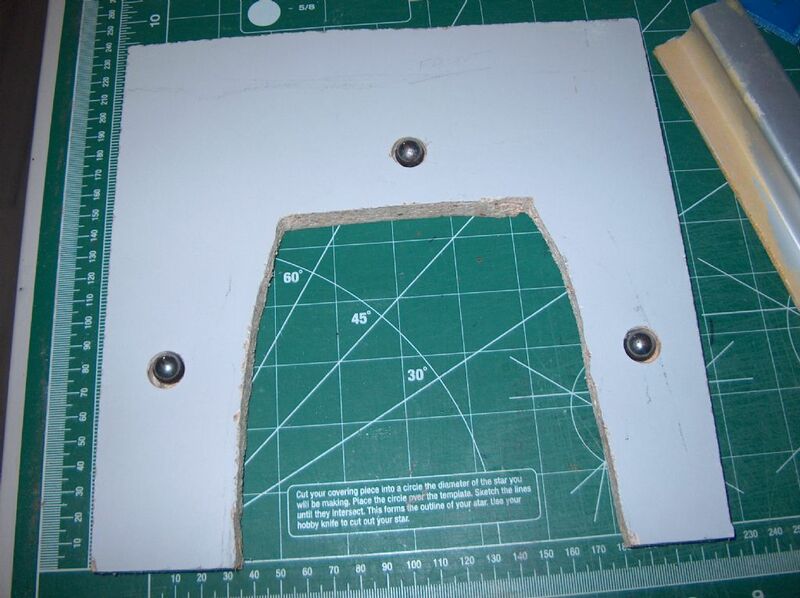 I am going to makea bottom Hatch so I glued some 1/4" triangle around the bottom. 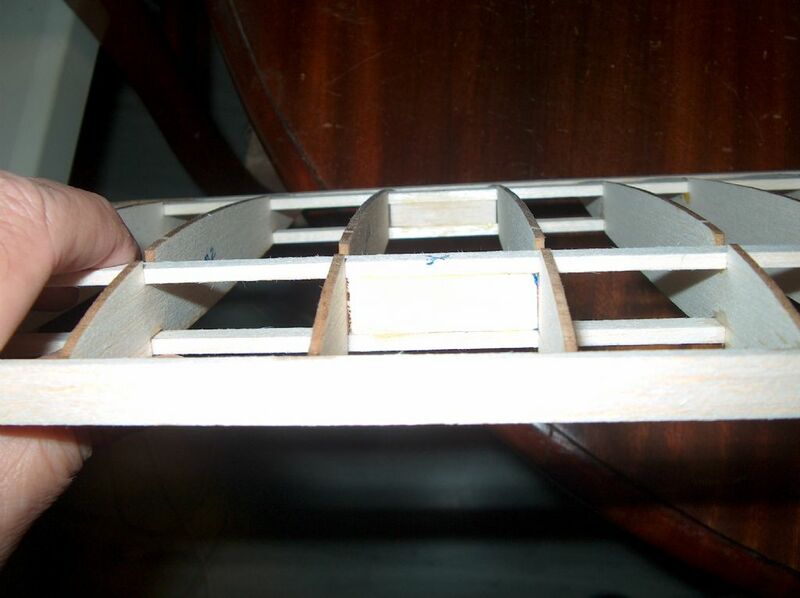 Prepared a plyt cover with balsa. Now drying. 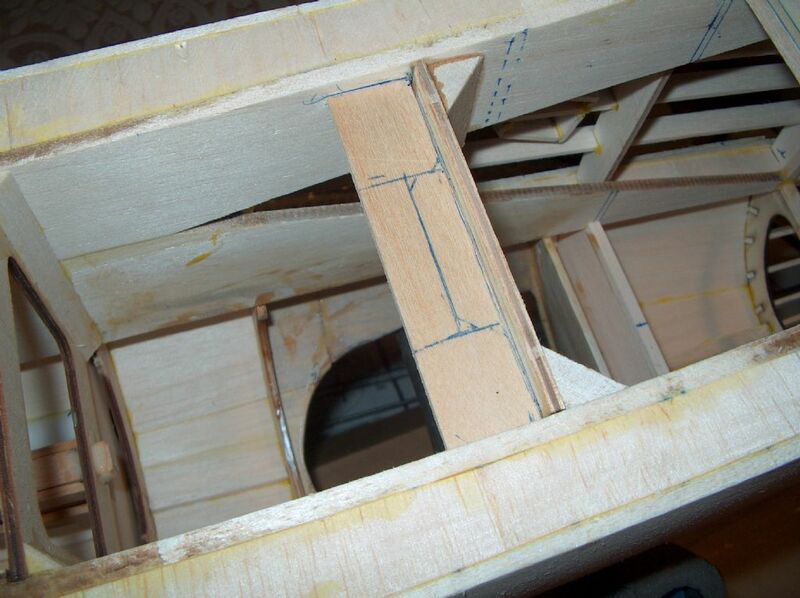 Tomorrow I`ll cut the Hatch and glue in situ. Next I`ll add the side cheeks with blue foam. 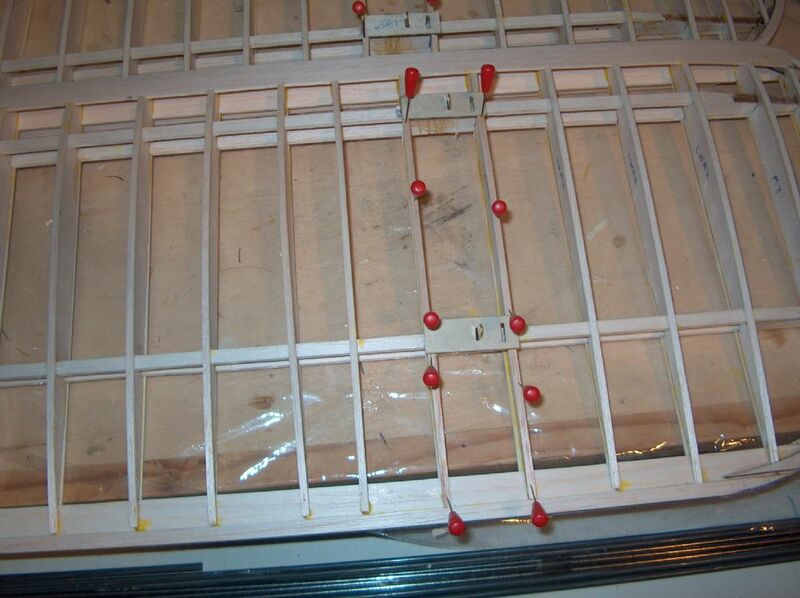 Completed all the capstrips on the bottom panels except the top of the ribs that support the struts. Also debur the brass parts and filled the top edges for avoiding cutting the thread. Fixed the brass parts with epoxi, tied with kevlar and fixed with glue. 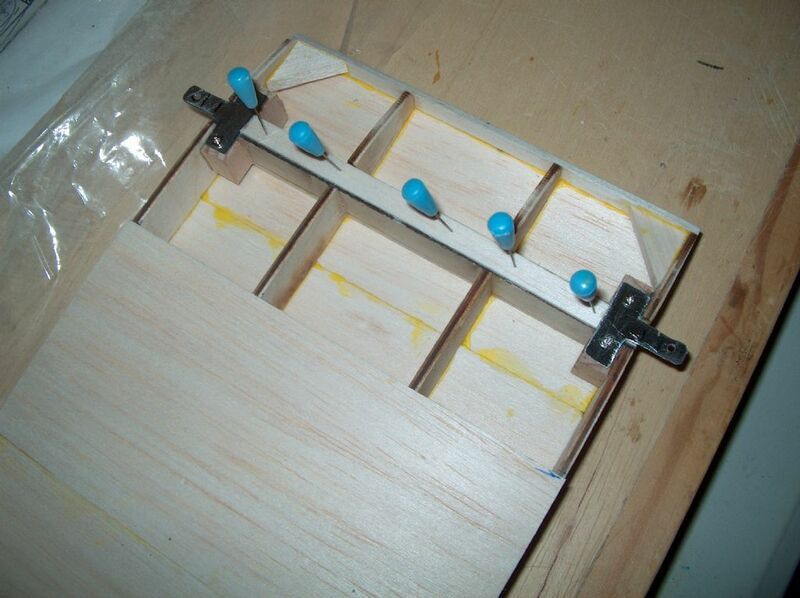 also added some balsa to fill the space betwen the ply and the spar. Need a bit of shapping. Today finished adding the bottom sheeting to both bottom panels. Tomorrow will add capstrips. I`d added a bit of weight with the landing gear modifications, but I have a few plans for saving weight. First whe I changed the Ply F1 with abalsa one I saved 50 grams. I`m finishing the plug for the cowl. The one I received fron "S" was in poliester resing and weighted 140 grams. Also was cracked in the bottom and I havn`t noted it. I think I can make one about 80 grams mark. So another 60 grams less. I had made a carbon spinner at 17 grams plus backplate. This is the pic of the brass part that joins both parts of the landing gear. Little progress last week. Take advantage of the fabulous weather we had last week- Little wind and temperatures around 20º C. Went flying three days in a row . 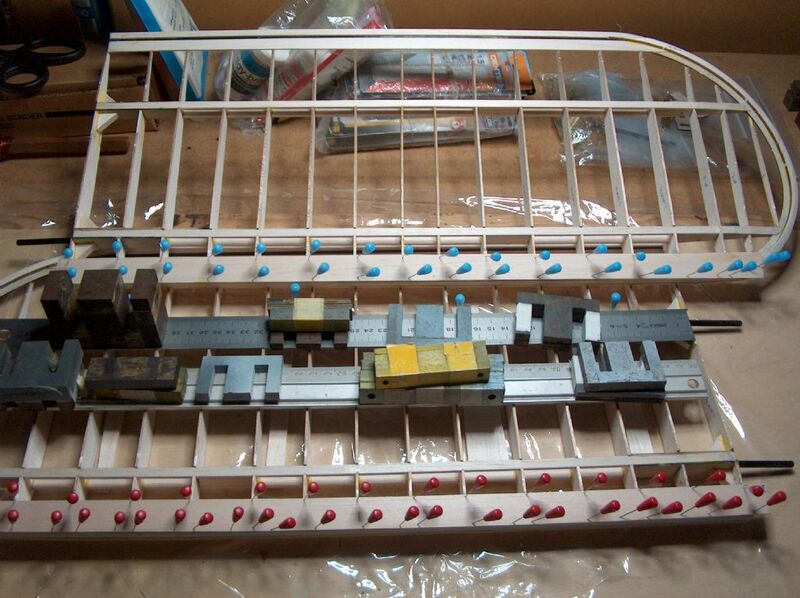 Aligned the wing with the fuse, drilled the holes for the blind nuts and fixed them. 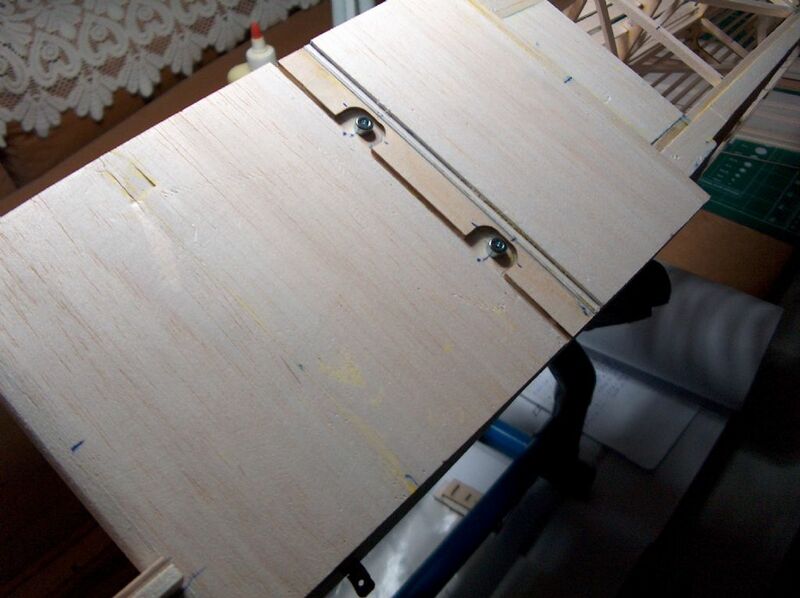 Once I have fixed the center panel of the wing on the fuse finished the landing gear. As I had glued the 4 mm piano wire to the oleos also used glue for fixing the brass part that hold the cross bar of the landing gear. Also had a hole for fixing the metal bracked of the rear part. This bracket is a comercial one from MP-Jet. 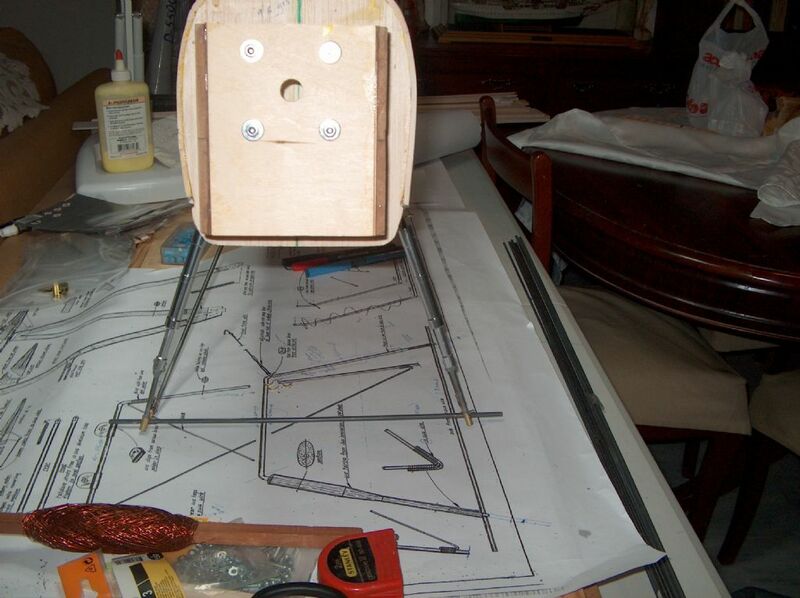 The cross bar can slide on the brass part, but checking the landing gear the piano wire takes the changes in geometry. 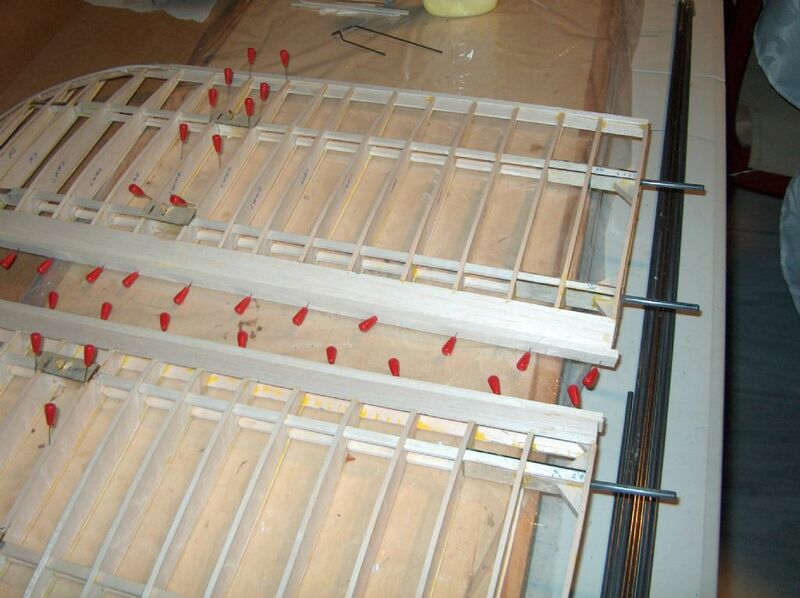 Today began work on the lower panels adding the leading Edge sheet. Tomorrow Will solder the parts. Need some gas for the torch. Im going to solder a brass fork to pivot the rear brace. Will check the movement on the compression state. 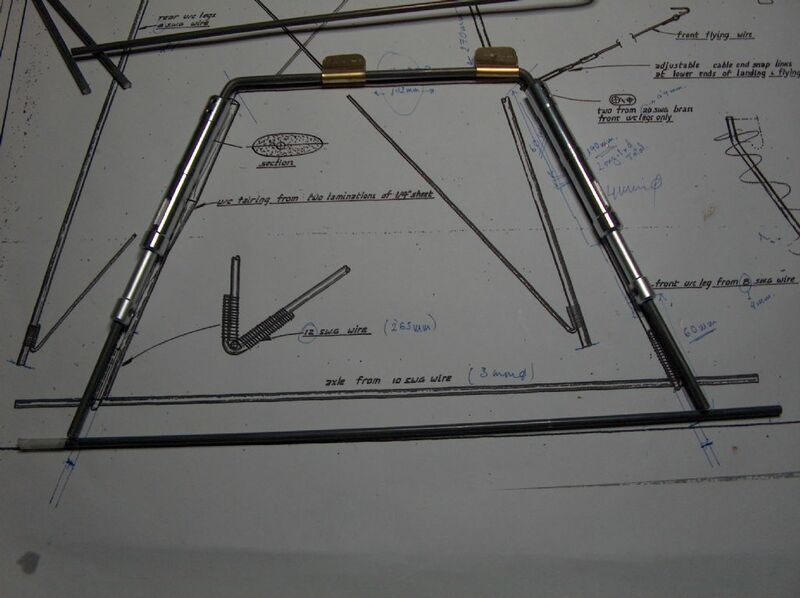 This weekend I`ve been working on the drawings of the landing gear for the MK i. Today began the fun factor. First I separated the brass parts from the main sheet. Tried a few methos of doing it. Hacksaw, jewellers saw, … In the end I used a heavy scisors and doing in áreas. Once cut I filed the surplus of the tabs with a jewellers file. 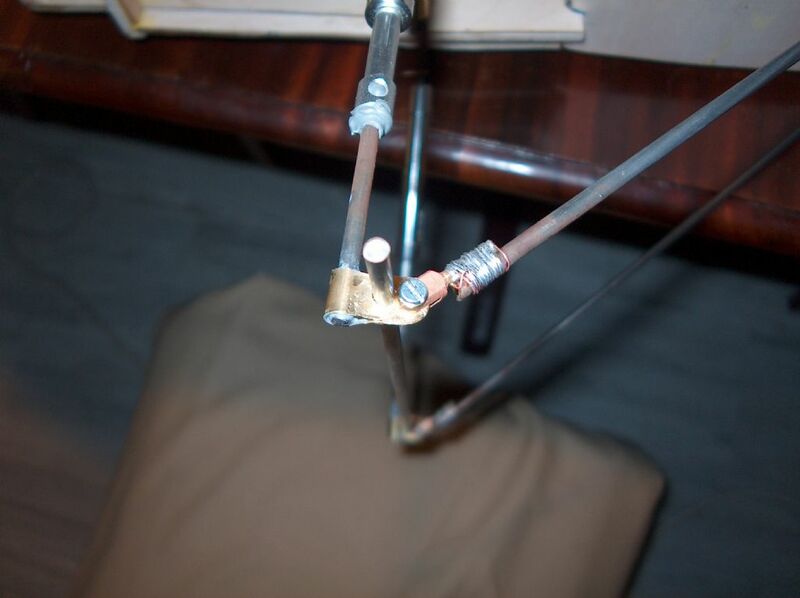 Bending the brass around the wire is tought. 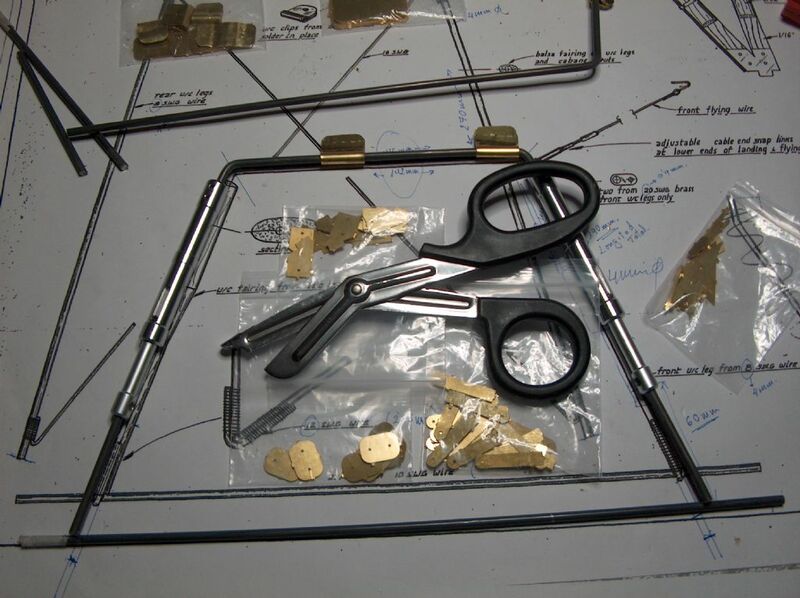 The scisors I used for cutting the brass parts. Also I classificated the parts in small bags. 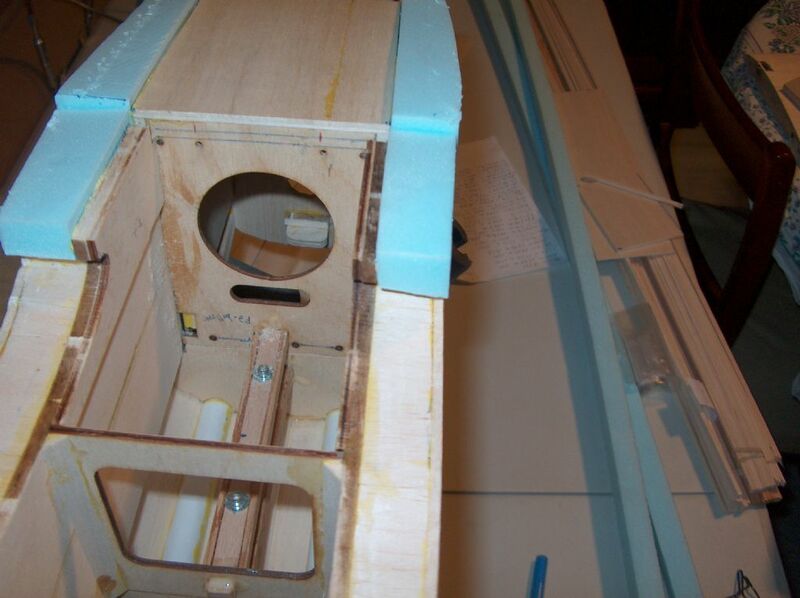 Main landing gear with tabs fixed. I extended the lenght of the legs 20 mm (the travel of the oleos). Have to glue the bottom wire to the oleo and add the suport for the landing wire on the top. 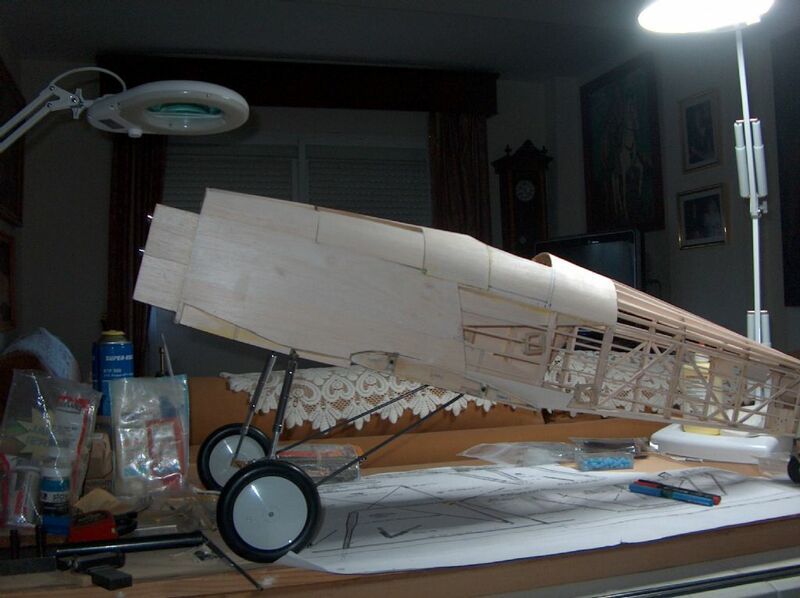 Next I`ll join both parts of the landing gear. The oleos are 110 mm in lenght. Added the infill in the strut área. Dear Teacher, I`m guilty. I havn`t looked at the Nimrod Pictures. Hope not to loose some points…. 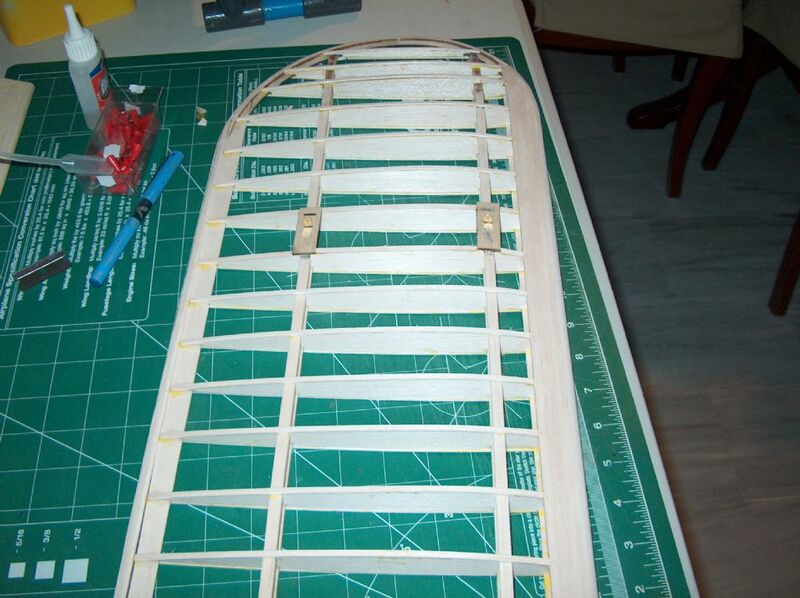 In your last pic appears that you had shortened the trailing Edge of the wing. Are you planning something ? Colin, Martin and Danny, Thanks for your comments. Only managed to work a bit on the plane. Added the leading edge to the center panel and sanded to shape. Also adjusted the position of the wing. 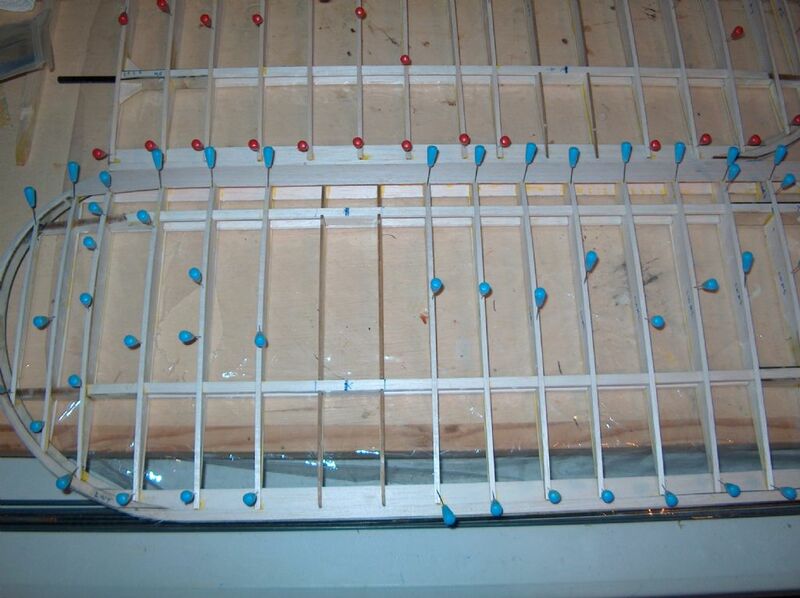 Drilled the holes for the wing bolts throught the top of the wing. 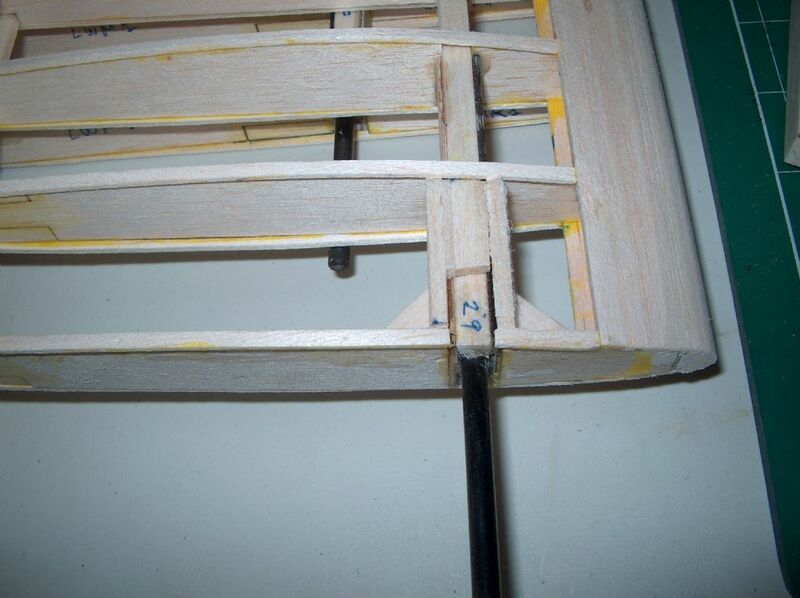 Positioned and glued the wing hold-down and some triangles tock for reinforcing the joins. The vertical part is the included in the parts set. 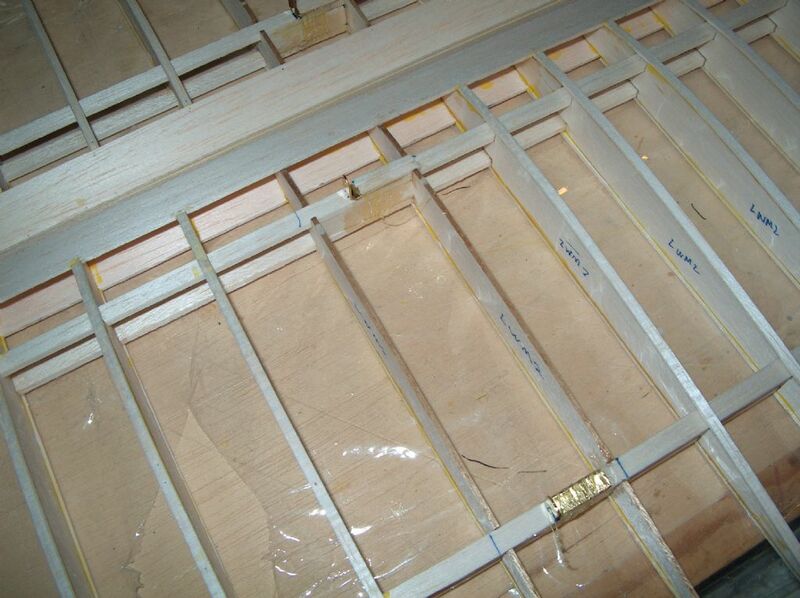 The horizontal is 3 mm ply (Hight quality. 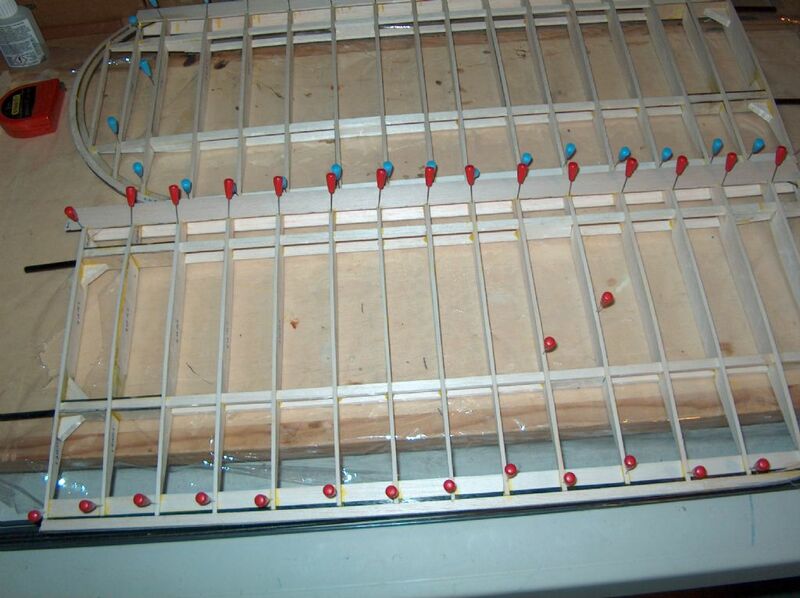 Once drilled I`ll add the blind nuts. Managed to work a bit on the center panel. Sheeted the bottom except the ply hold dowm part. 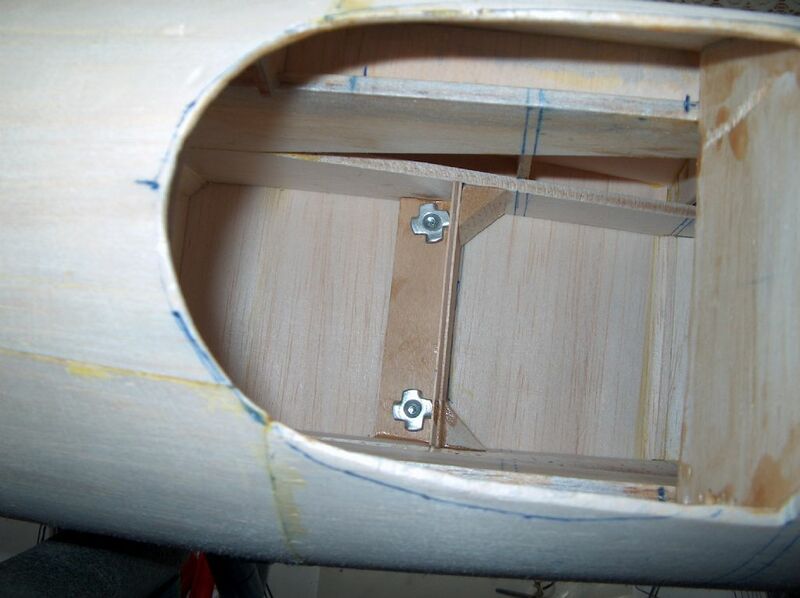 As Martin did I´ve added hardwood blocks in the front spar location to attach the flying wires. 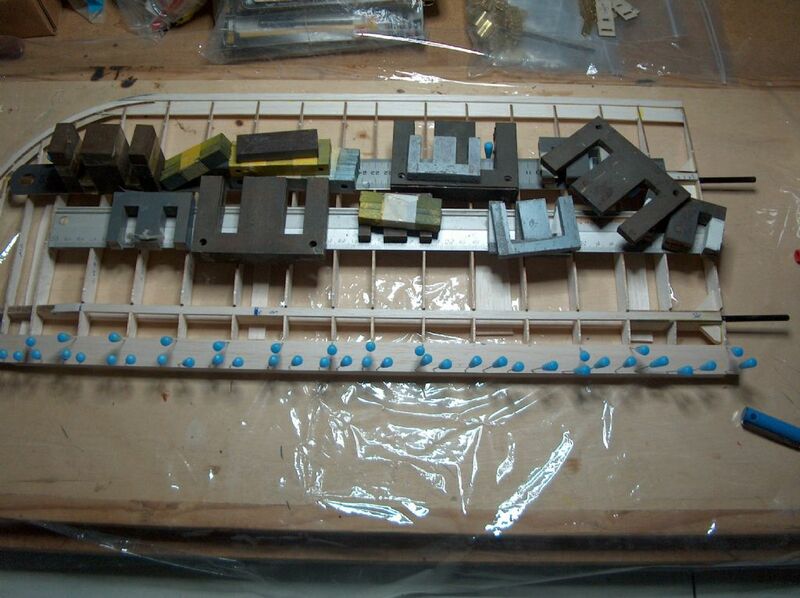 As I had not 20 swg brass sheet I`ve used some Steel plate. Once fixed in place I finish sheeting the top. 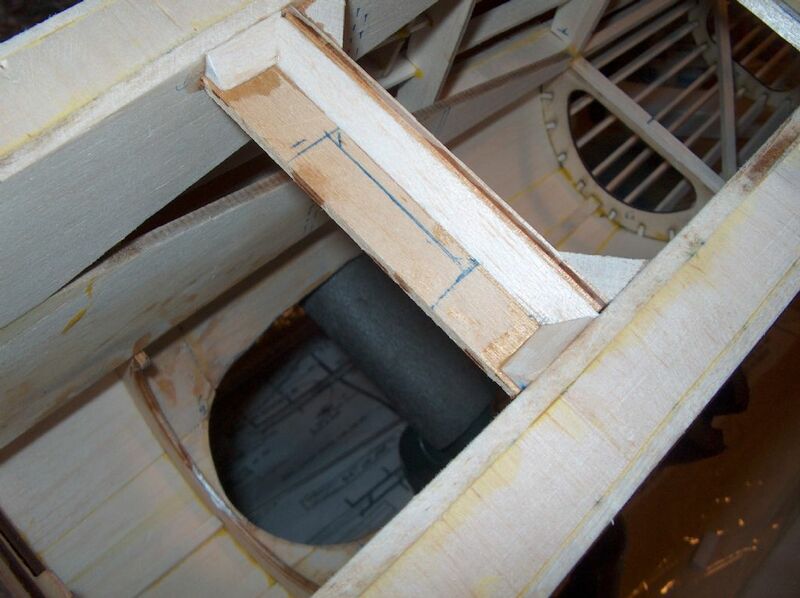 Fixed some 1/16" sheet to bridge the step over the spars.